Coming away from Pacific Theatre‘s latest show, Mother Teresa is Dead, I felt almost overwhelmed. 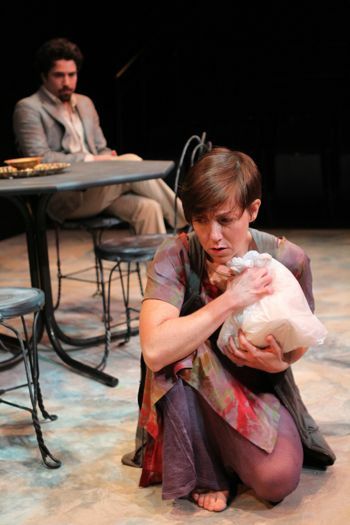 A guest production by The Bleeding Heart Collective, Mother Teresa is Dead is an intense, powerful drama wrought with emotion. I had just about no knowledge of the storyline before seeing the play last week, and as a result I had a surprisingly emotional response throughout the play, largely in part due to the outstanding four actors. With gripping performances, big questions, and no easy answers, Mother Teresa is Dead is a powerful play, written by Helen Edmundson, that makes you reconsider right and wrong. 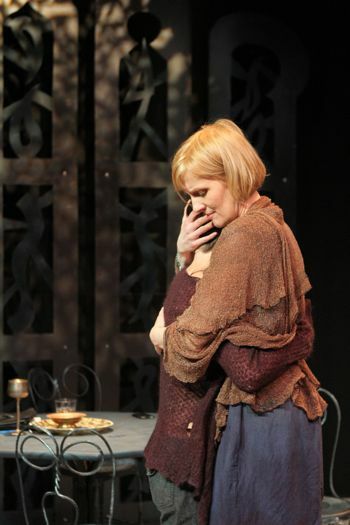 Julie McIsaac and Katharine Venour as Jane and Frances. Photo by Ron Reed. Helen Edmundson’s play opens with a Londoner, Mark, arriving in India in search of his missing wife. He is clearly frustrated and confused by his wife, Jane’s disappearance, who left Mark and their five-year-old son to work at a shelter in Madras. When Mark finds her, she is staying at the house of an expatriate Briton, Frances, and has clearly been through some kind of crisis. What follows is a difficult reunion between husband and wife, and a heated confrontation between Mark and Srinivas, the owner of the shelter who is trying to convince Jane to stay. Sebastian Kroon and Julie McIsaac as Mark and Jane. Photo by Ron Reed. I found Mark so unlikeable at first, with his anger, his irritation, his yelling. But as the layers pulled back, we learned that Jane abandoned him and their son. Soon, his anger felt justified. I began to sympathize with Mark. While he was harsh and merciless in his anger, I understood it. However, I found myself unable to blame Jane completely as she had just gone through some traumatic incident and did not appear entirely well. In addition, Srinivas and Frances, who first appeared charming and sweet, were later revealed to have their own skeletons. None of the characters were what they seemed. Yet Mother Teresa is Dead never once became apologetic or preachy; it simply asked some very big questions about life, moral conscience, and family. Kayvon Kelly and Julie McIsaac as Srinivas and Jane. Photo by Ron Reed. Mother Teresa is Dead is a play that made me think. There were no easy answers and no clear right and wrong. The characters were all so complex and yet each one was trying so hard to do good, or what was best, that I was left with so many questions. Was there a right or wrong? Were all the characters terrible, flawed people? Or were they all good people in a tough situation? Even now I can’t get my head around whether I truly liked Mark, Jane, Srinvas, and Frances and whether they were good people. Mother Teresa is Dead is a play I enjoyed immensely for its strong performances and for how much the characters made me think. That, I think, is always a sign of good theatre: when you’re left pondering the complexities of the characters long after the curtain has dropped. Congratulations to Kayvon Kelly (Srinivas), Sebastian Kroon (Mark), Julie McIsaac (Jane), and Katharine Venour (Frances) for their superb performances and to director Evan Frayne for a truly thought-provoking and enjoyable show.